Steve, EXCELLENT post! The industry is indeed in need of a serious culture change. Sometimes I wanna shake these good folks and say “Screw the process, and just cut right to the part that matters most so consumers/patients can benefit, and healthcare companies can do their thing to help patients.” I don’t think the wheel needs to be reinvented here. Ya, I get it. All the ducks need to be a row first… But in my mind, the time its taking is just too long and their delay is putting even more fear into those digitally unsavvy marketers who are too scared to do any “social” work until guidance is drafted. 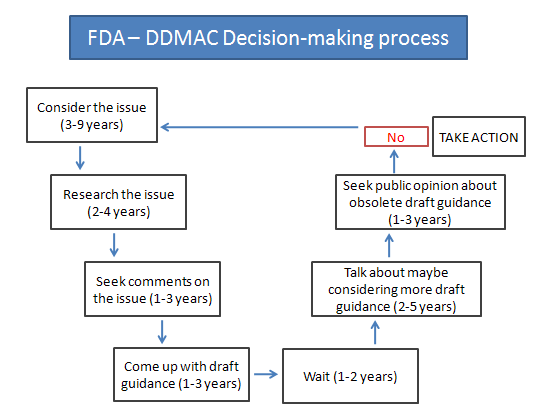 I had an experience with an organization who refuses to even “listen” to the social conversations b/c they want to see FDA policy in place first. I find that nutso! “Listening” to the social conversations is just that – listening. Are wrists really gonna get slapped by FDA for “listening?” Of course not. But I do think its time for a shaking. Leigh – what stands out most in your comment is the “ducks in a row” mentality – that is EXACTLY what we saw on display during the presentation. You can work so hard to get your ducks in a row that you don’t notice that, 1. we’re really dealing with swans now, and 2. the line for the row has changed. The futility of the exercise is vexing. I mean generally speaking… I do agree that the line for the row has changed, and with it, they (FDA) now need to change. The longer it takes them the row(s) will need to change many times. It certainly is frustrating. However, a number of companies have taken some baby steps into this minefield, and while some get their wrists slapped, some have had a modicum of success in building a digital footprint in a manner consistent with the regs and the regulators’ view of the world (however impenetrable that may be). Them that continues to wait for the issuance of the long-awaited guidance will be sorely disappointed. Much ground will be lost, and the guidance is not likely to yield a lightning bolt of illuminating clarity. I recognize that we’re talking about a highly-regulated and in some respects risk-averse industry, but safe steps forward into social media may be taken, just as they may be in other regulated industries. My personal experience also extends to the legal profession and the health care industry, but movement is afoot in the financial services industry, and other regulated industries as well. Bottom line: Can’t wait. Need to start now. If guidelines come out that allow more than what you start out with – fantastic. If not – you’ve still started something worthwhile. I’m beginning to think that a bunch of us need to crowdsource a basic guideline document – Practicing Safe Social Media in Pharma – based on the general principles that exist, and the things we’ve learned from the first generation of attempts thus far. It wouldn’t have the imprimatur of FDA Guidance, but as a common-sense summary, it could help companies feel more comfortable getting into the shallow end of the pool. I bet it could be done in four weeks! When I read your last two paragraphs, I couldn’t help but reflect on a book I just finished by Jim Collins, author of “Good to Great.” His latest book is called “How the Mighty Fall” and one of the companies highlighted in it is Merck. He posits that they diverted from their core ideology upon which they were founded and got caught up with short term profit and growth for its own sake. It’s an excellent read–I recommend it. Hadn’t heard about that one – thanks, Karen! I never liked how the FDA remains vague and slow in the past, but today I am much more forgiving of the FDA than I am of pharmaco management. I was looking at a recent run down of 2010’s lawsuits settled by drug companies and to say that I’m disappointed with industry’s continual hypocrisy. It’s one thing when you can say that you’re working toward implementation of compliance practices. It’s another when you take one step forward and 3 steps back as an industry in something as “common sense” as “don’t mislead the public” (in every which way that can be done via old media/new media). For so many years whether as employee or consultant, I have heard company management say “Patients are our #1 concern! People are our greatest asset! We want to do the right thing!” in public forums and company meetings. Then I look at the actions that are motivated by incentives and hidden rules at companies. I’m not surprised why the government keeps ramping up its prosecution arm. I get that pharma changes are slow, but this looks almost as if pharma wants to test how slow it can change. I’m not surprised the FDA has to “slow down to keep up”. I have read some of the recent untitled warning letters sent to pharmacos, and the violative actions from pharmacos. If I had to cull through the sheer amount of garbage that pharmacos continue to churn out as sales aid, my resources would come up short as well. I’ve been saying this for a while, and none of it surprises me. What the industry could have done – years ago – is focus on the parts of social media that don’t need guidance. Ambient content creation, accrued over time, would have at least angled up the trust ramp the industry sorely needs. It’s not just culture – it’s behavioral change that’s needed. Both are going to be difficult on the regulatory and industrial sides. Phil, it’s true that there’s still a bunch of stuff that pharma companies can do – and increasingly are doing – apart from any particular guidance. Looks like that will be the New/Old Normal for the coming days…! Welcome to reality ! Anyone that thinks that social media is going to save DTC marketing is sadly mistaken. Research now shows that more and more people are leaving brands behind on social media because brands have not learned that they are media today. Do we really expect at a time of downsizing that pharma is going to add people to implement social media ? Do you really believe that people want to have a social media relationship with a pharma company ? The FDA is looking at budget cuts again and right now they have other fish to fry besides social media & DTC marketing. What should be happening is that DDMAC should be allowing the one click rule to fair balance. If they believe that someone is going to see a sentence or two on a search that is promotional and then ask their doctor without doing research than they are truly living in the past. DTC marketers have always shortchanged interactive marketing. Hell most of them don’t even understand web analytics or how consumers are really using the Web for health. Rich, I’ve always felt that the “one-click” principle of access to complete product information is valid and workable. Though it actually doesn’t go far enough – what we really need is a far more approachable way of expressing product information rather than the nearly useless ISI/PI format. The first part of your “rant” hit on an issue I have seen in many bureaucratic organizations (both public and government)- the negative effects of NOT making a decision. Usually the worst decision is no decision. There are many situations throughout various industries where meetings are held to determine when to have a meeting to decide if a decision needs to be made…. all the while small and nimble competitors rise up to take their marketshare. 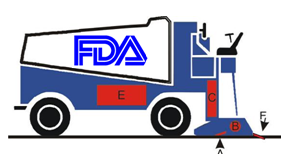 Perhaps a solution would be to limit the FDA to drug/med device approval and allow the FTC to handle how manufacturers could market said products (I know that goes against the current movement to consolidate and streamline govt agencies but if the FDA will not join the 21st century maybe another agency will). Such initiatives could be handled by the manufacturing associations but, as the second part of your note demonstrates, the manufacturers can not really be trusted to promote their products in an ethical manner due to the recent instances of off-label marketing, etc. And therein lies the conundrum! What bums me about the most of what you’ve written is how much this whole thing has gotten under your skin. I get it, trust me. Meaning, the frustration. That’s why you’re not seeing much of me these days in “the circuit”. I figured, I have a choice. I can either continue to slam my head against a wall hoping something will give, or we simply stop, think, re-group, and channel my energies into how we are going to change the world. The FDA is not the answer. Their guidance is not the answer. How pharma cos behave in light of regs or no regs will also not be the answer. The answer will come from identifying the problems we want to solve, picking the solutions we want to try, taking the risk and trying, not giving up when we fail, then getting up and going at it again … regardless of what the rest of the world is doing / or what they think of us. If you (we) genuinely believe that what is important is indeed important (as it clearly is to you, based on what you have written), then we owe it to ourselves (and perhaps the world around us) to do everything in our power to fight the good fight. I know you know this, but I thought I might as well write it down so I remind myself why I sometimes feel this way too, and what I need to do about it. So thank you for giving me a reason to remember why I fight. You know, Fabio, I really didn’t and don’t expect the FDA to be our knight in shining armor, leading us into the promised land of SocMed. I was just appalled at the blatant display of bureaucratic wheel-spinning. No help is coming from that quarter. Maybe it’s time to resurrect our idea of “Safe Social Media” Principles and just do it ourselves, as a common-sense crowdsourced outline of what seems to be do-able in the environment thus far. In? It was a good idea then, it’s an even better idea now. Yes, I’m in.